Our classmate, Pat Doyle, has died. I didn’t receive the news from a call on my phone. Instead, I received it via status update, which scrolled across my screen like any other on my birthday as I thumbed through friends’ updates and birthday wishes. Wendy’s words were stuck somewhere between a meme about Mondays and a meteorologist’s mea culpa about his miscall on the latest winter storm. I regretfully tell all of you that we lost a wonderful friend, Pat Doyle this last weekend. I was immediately struck with the memory of the call I got in March 12 years ago. Phil was on the other end, shaken, trying to find the words to tell me that our younger friend, Donnon, had just passed away. It was the first experience for many of us in losing a classmate so early in our lives, which were forever changed by his death. I read Wendy’s words as I had heard Phil’s: the reluctant bearer of bad news shared with a broken heart. It wasn’t hard for me to jump back another 25 years to 1989 when I had to make the phone calls to all of Dad’s friends after he had died. Nobody wants that job. Nobody. When that announcement is made, though, it cements a certain bond between friends and loved ones; we inherit and share a stark and indefatigable certainty that nothing is guaranteed, our time together is limited, and we will forever be bound by the love and the loss of the passing of our friend. When I arrived at Pat’s afternoon viewing, I heard the familiar voices flowing from the small Worthington Room just to my left. There they were, assembled together in the mix of tears and laughter, of hugs and shrugs, of generations of loved ones sharing in the grief and shock of Pat’s passing. I walked through the doorway, and it was like I had joined a sacred group of fellow grievers. In this room, despite our differences in age, demography, and even political or spiritual beliefs, we shared a common bond that would forever connect us. Pat and I weren’t that close. You could say we were always one radio station away from each other. 98 Rock and B104.3 (Means Music!) might have been on different ends of the music spectrum, but they were always just a twist of the dial from each other, as we all are as classmates. Immediately to my left and sitting on a small padded bench were two friends from Loch Raven. They called my name, and we shook hands, hugged, and shared memories of the good times and the shock of Pat’s passing. 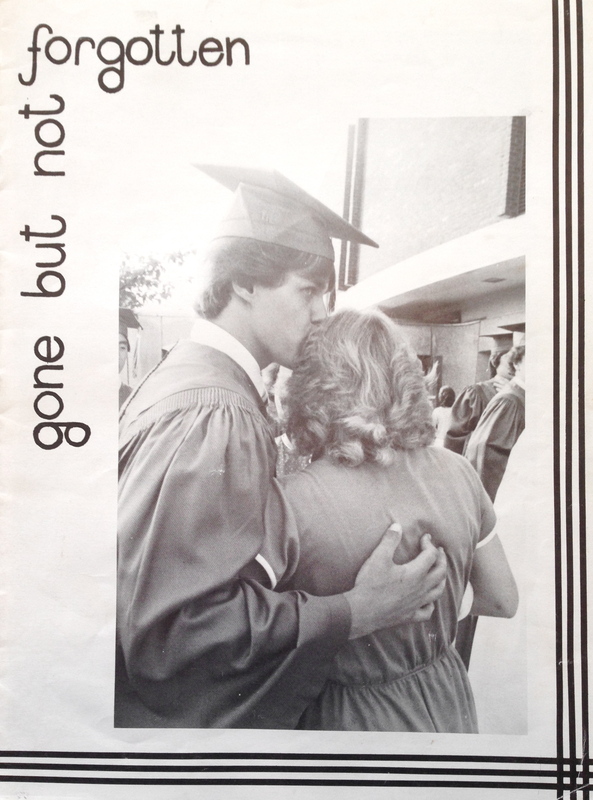 Another classmate entered the room, and when we hugged and talked about Pat’s final months, tears welling in our eyes, I realized that we were no longer classmates; we were brothers and sisters, siblings of the class of 1983. We did not stay in touch as often as we should, and we definitely did not see the world through similar eyes. Yet, in this small room in a funeral home wedged between a beltway and a busy intersection of car dealers and the National Guard Armory, classmates who shared math classes with Mr. Dwyer, Drama with Mr. DeVita, and English with the wit and charm of Eddie Marbury, we now shared a different kind of classroom, learning that love and friendship among the people you grew up with are the most important things we hang on to as we get older. As I made my way through friends and loved ones to pay my respects and say goodbye to Pat, who lay hidden within the closed coffin at the other end of the room, I stopped to offer Wendy a hug. She kissed me on the cheek and spoke with genuine kindness, a concern for all of us, and a respect for the fragility of life and love. Pat is gone, yes. But in his passing we recognize that we are still here together, and the very least we can do is care for each other as we never have before. We are no different than the signatures scrawled colorfully across the pages of our yearbooks; we carry with us the unique beauty of our individuality. These lines of love, of which Pat is one, will bind us as brothers and sisters, now and forever. This is what Wendy stirred within me, and I carried that feeling, that bond, as I approached Pat’s casket. I placed my hand on the curve of the casket’s soft wood and closed my eyes. Pat, our brother, had left us, and it was time to say goodbye. As I began to whisper my prayers, I felt a surge of energy that was bigger than me, bigger than this coffin or this room. 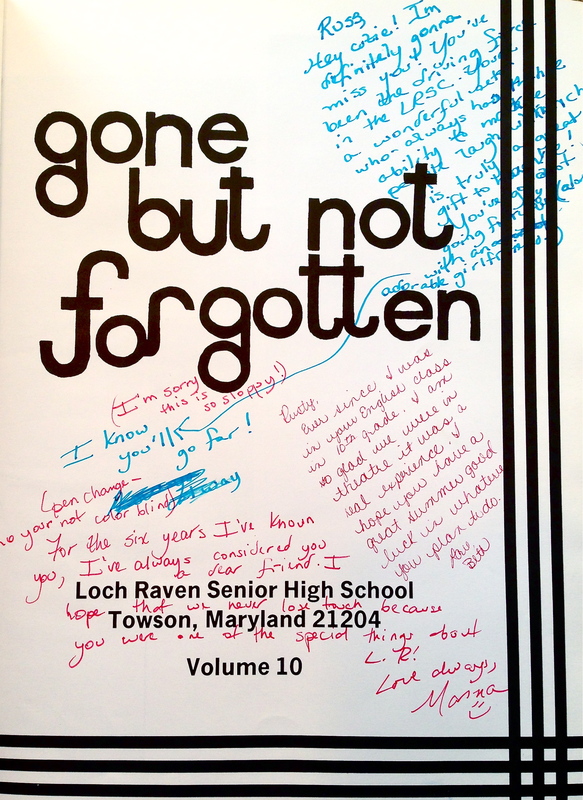 From handshakes to hugs, from tears to prayers, I felt the energy of hundreds of brothers and sisters around me near and far, all remembering the phrase of our 1983 yearbook: Gone But Not Forgotten. Like a slide show, the pictures of Pat that everyone had shared ran through my mind against the soundtrack of muffled words of comfort behind me. Here we were, just like countless others who have faced the passing of a classmate, with the charge to live our lives more closely, more sincerely. I lowered my head, kissed the soft, warm wood where my hand had been, and offered peace and promise to live and love more genuinely. It is the least we can do to stay close, to live with a daring charge to remember this fragility of life, and to carry our brothers and sisters tomorrow as we do today. Rus, Your words about Pat, his family and friends, and the class of ’83, weaved together a literary patchwork quilt. Each word, a stitch of thread, bonding our past with our present. The people who came into our lives as children and teens, have helped shape us into who we are as adults. Pat Doyle was one of those people who came into our lives and made us better for having crossed paths with him. Pat, with his warm, brilliant smile and always at the ready with a kind word, was something I looked forward to each school day. His unique gift of never judging anyone, made everyone feel welcome and comfortable in his presence. His awesome sense of humor gave us all, including our teachers, a good, daily dose of laughter. Pat brought people together. We are all saddened by Pat’s death. But we are strengthened by his bringing us together, even under these difficult circumstances. Some were unable to attend his viewing and some were unable to attend his funeral, but for those of us connected by social media, were we all able to express our heartfelt sympathies on Pat’s passing. Thank you, Wendy, Rus, Chris Muffaletto, Chris Lambros, and others who posted of Pat’s passing. We are sorry for the loss of our classmate…our friend. Pat’s light was bright in life. His light in death is even brighter now that he is home with God. They say laughter is the best medicine. We thank Pat Doyle for giving all of us our daily dose and the wonderful memories we share of him. We thank God for bringing Pat into our lives and blessing us with his friendship. Thank you, Rus, for providing us with your blog and your beautiful tribute to yet another fallen classmate. We appreciate you and all you do in keeping the LRHS community informed and engaged. Tawny, I cannot thank you enough for contributing your own beautiful words honoring Pat and our tight-knit family. I appreciate you, and let’s all raise our glasses to our brothers and sisters; may we continue to tighten the net so that we all stay close. Beautifully written, both Russ and Tawny. I just read this today, missed it before. It the wake of Joe’s loss, it has certainly hit home and I can’t agree more that no matter how many radio stations away we are, there is a common bond that exists that can’t be broken.